After Ben Revere (basically my new favorite player not named Harry Leroy Halladay III) got a clutch single last night, he got all gritty and fired up and emotional and what not. The Phillies went on to win, so it was pretty dope. 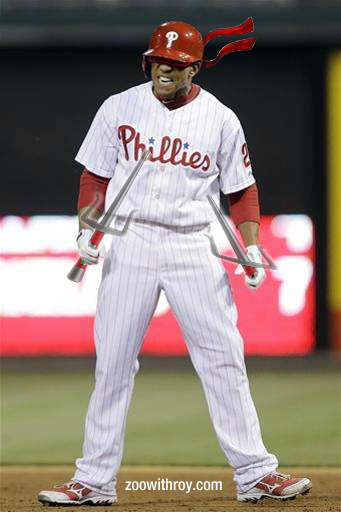 And the original pic was awesome, but after a quick look I knew exactly how it needed to be altered, forever changing your impression of fired-up-Ben-Revere. I would definitely maybe buy a Ben Revere Ninja Turtles t-shirt. Make it happen ZWR!